NEW YORK (CNNfn) - It's hard to believe there will be a time when Mets catcher Mike Piazza won't be able to send home runs screaming over the back fence. It's hard to believe that someday Yankees pitcher Roger Clemens won't be throwing 95-mph fastballs smoking over the plate. But long after the World Series is over, the players will have to think about a cruel reality of professional sports: Those fat salaries won't last forever. Financial advisers say long-term planning is especially important for professional athletes whose careers may get cut short because of injuries, gaffes on the field or plain old aging. "I want them to live on the assumption that they won't play another game," said Charles Sims Jr., a certified financial planner (CFP) in Memphis, Tenn. The movie "Bull Durham" recounted the hard life of minor league ball players, who carry their own luggage and earn tiny paychecks. Once a promising hitter makes it to "the show," he can earn four or five times as much. The same is true in hockey, football, basketball or any pro sport. When you finally make it to the top level, you can be an overnight millionaire. All of a sudden, you can have that Mercedes, Italian-made suits and a penthouse apartment. "It sounds silly but some of the arguments I've had with young players have been around what car to buy," said Stephen Freyer, a sports agent in Peabody, Mass., who negotiates contracts and offers financial advice to clients. 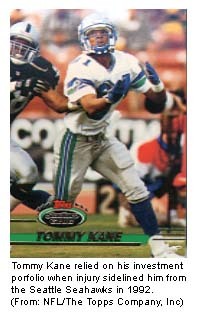 NFL player Tommy Kane faced newfound wealth in 1988 as a starting wide receiver for the Seattle Seahawks. Kane, who grew up in a low-income neighborhood in Montreal and attended Syracuse University in New York on a sports scholarship, had wide eyes when he was signed to a three-year contract averaging $150,000 a year with a $120,000 bonus. And like most athletes with a new salary, he went shopping, buying a $30,000 Mercedes Benz sports car. "That was my toy. I wanted to treat myself," said Kane, now 36. A few years later, Kane bought a house for his mother in a modest Montreal neighborhood. Luckily, his spending spree stopped and he started saving money. Because in 1992, his career was cut short with an Achilles tendon injury. "I didn't really spend a lot of money because I didn't want to go back to where I came from, and I was focused on putting money away," said Kane, who lives with his wife and four children in Montreal. After his injury, Kane earned a modest salary with the Canadian Football League as a commentator, but survived financially by relying on his portfolio with stocks like EMC Corp (EMC: Research, Estimates). Kane says that stock helped catapult his savings $4,800 to $240,000. But most importantly, Kane saved 70 percent of his salary during his NFL days. Many athletes are so eager to start their new pro careers that they don't think about planning for the future. They focus on the right swing, the perfect layup, the touchdown. So financial advisers have to set their clients straight. �"You assume the parental role," said Freyer. "You say, 'It would be nice to buy a Mercedes, but this would be the impact. You could put $50,000 into a deteriorating asset, or you could invest it in buying a house or condo.'" Sims said he makes his clients stick to a monthly budget and encourages them to buy a "normal" house instead of a lavish spread. 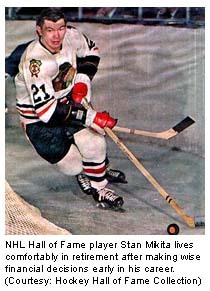 Stan Mikita, a retired Hall of Fame hockey player, knows the advantage of planning ahead. Mikita hooked up with a financial planner early in his 21-year career with the Chicago Blackhawks. Today, he lives comfortably. "I was put on a budget and tried to stay in it," said Mikita, 60, who was inducted into the NHL Hall of Fame in 1983. "You can always call and say, 'I need some money.'" Professional athletes obviously don't have the job security or cushy benefits of a traditional workplace. The average length of a football career is less than four years. The National Football League Players Association introduced a 401(k) plan in 1997 for its members. Most other sports don't offer such a plan. While most athletes won't qualify for a Roth IRA because their income is too high, they may want to consider a traditional IRA. 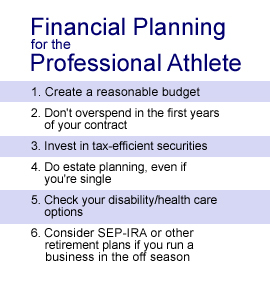 And athletes who own restaurants, bars or other small businesses may want to consider options like a SEP-IRA plan. Another factor to consider is that when your salary reaches six or seven digits, you could be looking at a huge income tax bill. Financial planners often recommend a portfolio that includes tax-free securities. Hockey star Ray Bourque, defenseman for the Colorado Avalanche, holds municipal securities - which are tax-free investments - in his home state of Massachusetts, according to Freyer, Bourque's agent. Bourque shelters a portion of his salary from taxes since he's in the highest income tax bracket. Bourque, 39, is expected to earn close to $6 million this year in salary and endorsements. Athletes should also think about estate planning to protect their nest eggs for their loved ones, financial planners say. "Every state has an estate tax law, which is law on how money is distributed, so if you don't have a will, the state will decide who gets what," said CFP Robert Glovsky in Boston. Kane, the former NFL player, remembers his early days growing up in a low-class neighborhood in Montreal. Today, Kane is doing so well he created a foundation to help underprivileged children and is raising money for local charities. As the father of four children - T.J., 6; Tyriq, 3; Tremaine, 2; and Tasia, 6 months - Kane is used to giving advice to young people. And for young athletes just hitting it big, he says: "You can live like a millionaire the rest of your life. Don't live like a multimillionaire for a few years." News about 401(k)s and IRAs from CNNfn.com!